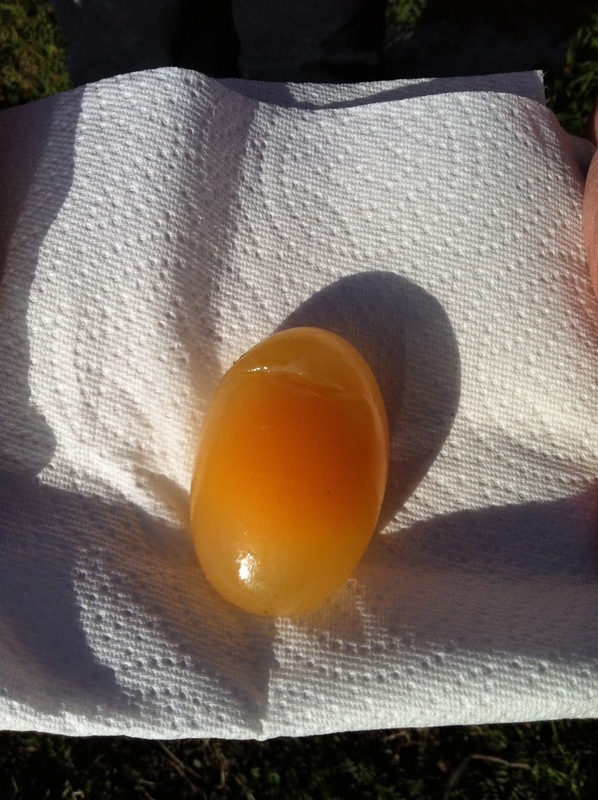 Today one of the hens laid a "naked egg", an egg with no shell. How does this happen? Is it bad? yolk is made here, then albumin here, then the membrane and shell down here, as it travels from the ovary down to the cloaca, where it exìts the body. For some reason, this brings images of the old Lucille Ball episode where she and Ethel are working in a chocolate factory trying to keep up as the chocolates go by on the conveyer belt. To answer the question, "is it bad when a shell less egg happens?" If nutrition is good, particularly if the hen has plenty of calcium, the major component of the shell, and if she otherwise appears healthy, then it is probably just one of those things that occasionally happens. It is more common with brand new layers (as mine are) or very old layers. Because a shell less egg can occasionally break inside the body of the hen, which COULD cause problems, I will just monitor all the hens, checking their "backsides" for the next day or two. But I dont really expect problems. Weather: would you believe it is snowing again? It is relatively warm, in the 20s, but the totals are expected to reach 18-24 inches. ugh.